Today my guests are developers at Capcom1 who made the Resident Evil Revelations game for the Nintendo 3DS system. Thank you for coming. 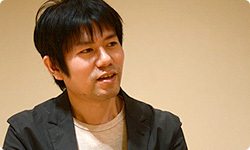 1Capcom Co., Ltd.: A video game developer. Headquarters: Osaka. No, not at all. The fans will enjoy it more if I talk to people in different positions since we’ll be able to talk about it from different angles. I’m looking forward to our discussion. Firstly, I would like you to introduce yourselves briefly and tell us what you were in charge of. 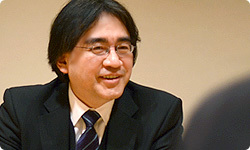 Kawata-san, we met before in the “Nintendo 3DS: Third Party Game Developers” series of “Iwata Asks.”, so this is our second time. Yes. 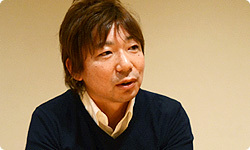 I’m Masachika Kawata, producer of Resident Evil Revelations. Beside me is Takenaka-san, who is with the team as my assistant producer. 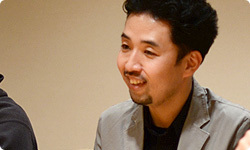 I’m Tsukasa Takenaka. Nice to meet you. 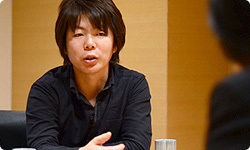 I worked on the Megaman Battle Network series2 and I was director of Megaman Battle Network 5: Double Team DS.3 After that, I was a planning man together with Nakanishi-san for Resident Evil 5.4 2Megaman Battle Network series: A series of data action RPGs. The first game, Megaman Battle Network, was released for the Game Boy Advance system in Japan in March 2001. 3Megaman Battle Network 5: Double Team DS: A data action RPG released for the Nintendo DS system in Japan in July 2005. 4Resident Evil 5: A survival horror game released in March 2009. The Resident Evil series is known as the Biohazard series in Japan. At Capcom, “planning man” is what you call in-house people in charge of planning, right? Okay, I’ll take over. 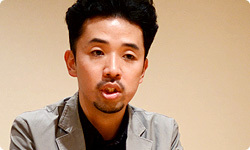 (laughs) I’m Koshi Nakanishi, director of Revelations. I haven’t been at Capcom that long. It’s only been four years, but I came in as a planning man part of the way through Resident Evil 5. I was chief of this project, but everyone has been in the industry for about 15 to 16 years. 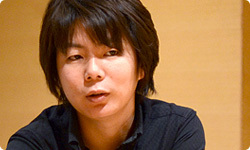 But Hori-san came from a different industry. Even so, he’s been soldiering on for about ten years. I think I’ve been nothing but nice to you. 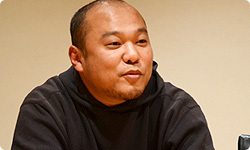 (laughs) And down at the end is Suzuki-san in charge of sound. I’m Kota Suzuki. This is my ninth year in the industry. Recently, I’ve worked a lot on the Resident Evil series. As a composer, I’m mainly in charge of music. I worked on Resident Evil 5 and Resident Evil: The Mercenaries 3D.5 This time, like before, I coordinated the overall sound. 5Resident Evil: The Mercenaries 3D: A survival action game released for the Nintendo 3DS system in Japan on June 2, 2011. Alright, thank you. At Capcom, you made both Resident Evil: The Mercenaries 3D and Resident Evil Revelations for the Nintendo 3DS system. How did the projects kick off? Who would be best to answer that? I guess I’ll answer! (laughs) I became involved with this project a little before the E36 of 2010. Hearing that there was going to be a piece of hardware that could show 3D without special glasses, the first thing I thought was I wanted to make a full-on Resident Evil game rather than just port the series into a handheld system and set that as my goal. Another thing was that, whereas Resident Evil 47 had changed the model for the series of the numbering titles from there on, I wanted to get back to the origins of the series by returning the direction to its horror roots. We created a team that could create a truly frightening Resident Evil. 6E3 (Electronic Entertainment Expo): A video game trade show usually held once a year in Los Angeles. 7Resident Evil 4: A survival horror game released for the Nintendo GameCube system in Japan in January 2005. It’s that way with everything, but when a franchise continues for a long time, it can really take a massive shift in direction along the way. The big change with Resident Evil 4 served its own purpose in a very important way, but what you did earlier in the series was closer to what would be considered truly scary, frightening horror. That’s right. Many people still say that Resident Evil8 for the Nintendo GameCube system was the best game in the series. So this time, we wanted the fans to enjoy the fear element. And, of course, we talked about wanting to make use of the know-how we had gathered up to that point to provide a great entertainment experience. We also talked about giving it a lot of volume. 8Resident Evil: A survival horror game released for the Nintendo GameCube system in Japan in March 2002. This game was the first game in the series for the Nintendo GameCube system. You made a promise to the fans about quality, sort of cracking the whip over your own heads. Then when the specs actually became known, the atmosphere of the 3D really fit horror and the Resident Evil feel, so after E3, we decided to head in that direction. But at that time, no one had used the Nintendo 3DS system much yet, so the stereoscopic 3D elements weren’t going very well. So with learning points like that, whenever there was an opportunity for an exhibition, we put a version for test play out, had as many people as possible try it, and tried to remove anything unsatisfactory that came up. That was incredibly useful this time. You didn’t just use the exhibitions for promotion, but interacted with those who tried it out. Machines are funny. The more you fiddle with them, the more you find ways to improve their performance. When a team makes a game, they are able to make changes to everything from the visuals to game elements more the second time than the first, and more the third time than the second.